Temperature class or ignition temperature of the gas, liquid, vapour, mist, dust or fibre. Where applicable, the gas, vapour or dust classification in relation to the group or sub-group of the electrical apparatus. Electrical apparatus complying with the requirements of a recognised standard for industrial electrical apparatus, which does not, in normal operation, have ignition capable hot surface and does not in normal operation produce arcs or sparks. This equipment must be in an enclosure with a degree of protection and mechanical strength suitable for the environment and be assessed by a person who is familiar with the requirement of any relevant standards and codes of practice. IEC/EN 61241-1 - Electrical apparatus for use in the presence of combustible dust. Protection by enclosure 'tD'. Exp - Pressurised Enclosure / Rooms (power apparatus) - Equipment is pressurised with a positive pressure; gas cannot get in for air coming out or equipment is purged with a diluting gas such as air. If air is used, it is ducted in from outside the hazardous area. Exi - Intrinsic Safety (instrumentation, control, measurement) - Any arcs or sparks in this equipment has insufficient energy (heat) to ignite a vapour. Equipment can be installed in ANY housing provided to IP54. A 'Zener Barrier' or 'opto isol' or 'galvanic' unit may be used to assist with certification. Exn - Non Sparking (motor, lighting, junction boxes, electronics) - Equipment is non-incendive or non-sparking. 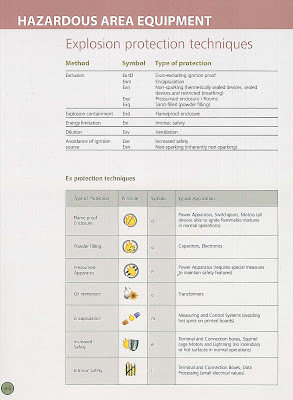 Exs - Special Protection - This method, being by definition special, has no specific rules. In effect it is any method which can be shown to have the required degree of safety in use. Much early equipment having Ex s protection was designed with encapsulation and this has now been incorporated into IEC 60079-18 [Ex m]. Ex s is a coding referenced in IEC 60079-0. 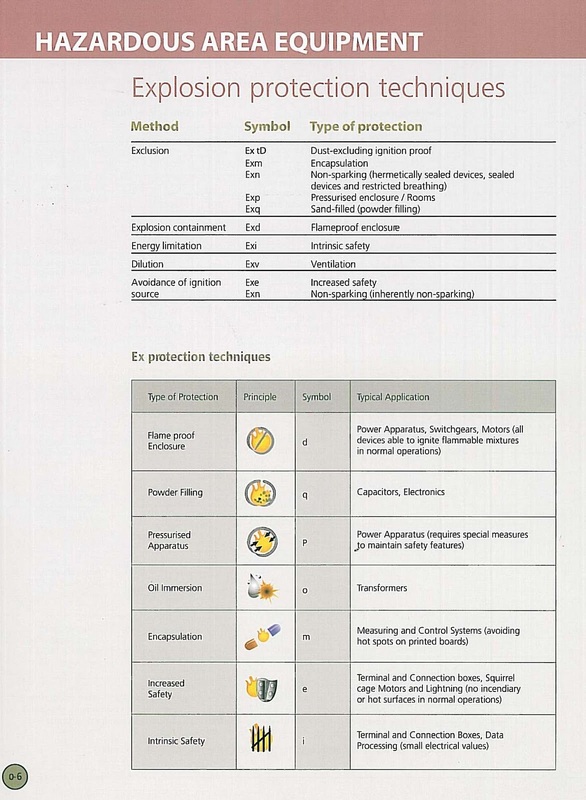 The use of EPL and ATEX Category directly is an alternative for “s” marking.